Welcome to this EccoBike™ website – www.eccobike.ca, microsite, or mobile site (this “Website”) or mobile application (“App”). Please review the following terms and conditions (“Terms and Conditions”) before using this Website/App. These Terms and Conditions, which may be modified from time to time, apply to all visitors to, or users of, this Website/App. Your use of the Website/App confirms your acceptance of these Terms and Conditions and your agreement to be bound by them. If you do not accept these Terms and Conditions, do not use this Website/App. In the event of a violation of these Terms and Conditions, EccoBike™ reserves the right to seek all remedies available by law and in equity. We may terminate your access or use of this Website/App at any time, for any reason or no reason and without prior notice to you. We may at any time and from time to time revise these Terms and Conditions by updating this posting. You should visit this page from time to time to review these Terms and Conditions to learn of and understand any changes because they are binding on you. Your use of this Website/App following any such revisions constitutes your agreement to follow and be bound by the terms as revised. All online, over the phone and (POI) transactions fall under our terms and conditions. The design of this Website/App and all of its materials, including, but not limited to, its software or HTML code, scripts, text, artwork, photographs, images, designs, video, audio, and written and other materials that appear as part of this Website/App (collectively, ‘Content’) are protected by U.S. copyright laws and the other U.S. and international laws and treaties. All Content is provided by EccoBike™ under a limited license as a service to its current and prospective customers and may be used only for personal (i.e. that is, for the purchase of our merchandise) use. This limited license is subject to the following restrictions: (a) you may not copy, reproduce, publish, transmit, distribute, perform, display, post, modify, create derivative works from, sell, license, allow others to copy, or otherwise exploit this Website/App, any of the Contents, or any related software; and (b) you may not access or use the Website/App for any competitive or commercial purpose. Any unauthorized copying, alteration, distribution, transmission, performance, display, sale, or other use of the Content is prohibited. EccoBike™ may revoke this limited license at any time for any or no reason. 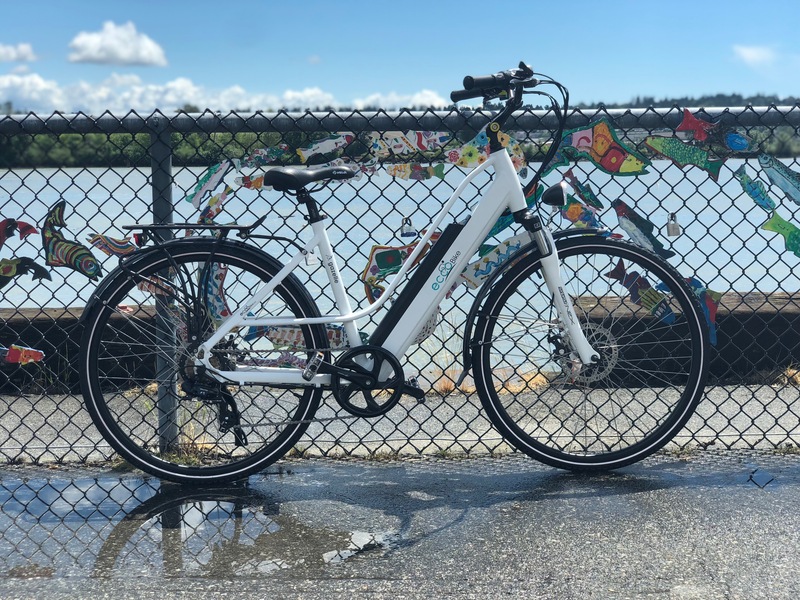 Any unauthorized use of EccoBike™ Content, such as framing, inline linking or other association with content or information not originating from the EccoBike™ Website/App is not permitted. Linking to any EccoBike™ web page also is prohibited. At EccoBike™, we take pride in our brand and do not condone and will not tolerate any unauthorized use of our trademarks, trade names, logos, names. The Trademarks are protected by U.S. and Canadian states trademarks laws and international laws and treaties. No license for the use of the Trademarks is granted to you under these Terms and Conditions or by your use of the Website/App. Unauthorized use of our Trademarks and Trade Dress in any manner is strictly prohibited. All comments, feedback, suggestions, ideas, and other communications (collectively, ‘Communications’) submitted or offered to EccoBike™ via this Website, in connection with your use of this Website, or through email, postal mail, phone support, or any contact with us, shall be and remain property of EccoBike™. EccoBike™ shall be free to use any ideas, concepts, know-how, or techniques contained in any Communication you send to us for any purpose whatsoever including, but not limited to, developing, manufacturing and marketing products using such information. Any personally identifiable information you provide to EccoBike™ through the Website shall be subject to our privacy, and personally identifiable information is defined here. You may choose to register with us through our Website/App and create an account (the ‘Account’). If you do, you will have access to your Account by providing an email address and password. You are responsible for maintaining the confidentiality of your access information and for controlling access to your Account and your device. You agree to accept responsibility for all activities that occur under your Account. We may terminate your Account at any time, for any reason or no reason and without prior notice to you. (a) Posting such Generated Content constitutes your consent and grant to EccoBike™ of an irrevocable, non-exclusive, perpetual, worldwide, royalty-free, unrestricted, and unlimited right and permission, but not the obligation, to utilize, reproduce, exploit, alter, edit, modify, distribute, publish, exhibit, digitize, broadcast, display, publicly perform, and prepare derivative works of the Generated Content, your name, likeness, voice and biographical information, and any material based thereon or derived therefrom, in any form or media now or hereafter known for any and all purposes throughout the World whatsoever, including, without limitation, advertising, marketing or commercial purposes, without any payment to or further authorization by you. (b) You waive any right to inspect or approve product in which EccoBike™ may eventually use your Generated Content and understand that EccoBike™ may crop, shape, or otherwise adjust any Generated Content. (c) You represent and warrant that the Generated Content will not violate the intellectual property or proprietary rights of any third party and are legally entitled to post the Generated Content and to grant all relevant licenses and permissions to use the Generated Content as contemplated herein. (d) You agree not to take any legal action against, and release and discharge EccoBike™ and its directors, officers, employees, agents and affiliates, or any other person or entity acting on its behalf, from all claims in connection with the use of the Generated Content, your name, likeness, voice or biographical information, as contemplated herein. (e) You understand and agree that such Generated Content may be accessed and viewed by others, including by the general public, and, whether or not such Generated Content is published, EccoBike™ does not guarantee any confidentiality with respect to any user Generated Content. You are solely responsible for your own User-Generated Content and the consequences of their publication on this Website or elsewhere (assuming we choose to post them once submitted). We reserve the right to determine in our sole discretion whether user Generated Content is appropriate; whether it complies with these Terms and Conditions, our standards, and applicable law; and whether they may be posted or removed. This Website/App and all Content of the Website/App are provided to our customers and prospective customers “AS IS” and “AS AVAILABLE” and without warranties of any kind, whether express or implied, including but not limied to, those of merchantability, fitness for a particular purpose, title, or noninfringement. You acknowledge, by your use of the Website/App, that your use is at your sole risk. Some jurisdictions do not allow the disclaimer of implied warranties. In such jurisdictions, the foregoing disclaimer may not apply to you. In no event will EccoBike™ be liable to any party for any direct, indirect, incidental, special, consequential or punitive damages for uses of this website / app or any other linked website, including, without limitation, lost profits or revenues, costs of replacement, business interruptions, loss of data or damages resulting from use or reliance on the information present, even if Eccobike™ is expressely advised about the possiblity of such damages. In some jurisdictions, limitations of liability are not permitted. In such jurisdictions, the foregoing limitations on liability may not apply to you.